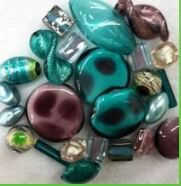 Venetian bead dealer, Nicole Anderson will be joining Bead Jungle from Wednesday February 13th through Saturday February 16th, 2019 for her annual display of Venetian Glass Beads. She brings with her each year the newest and hottest items from Italy plus all the old standards that all of you have been yearning for. Come join us and pick out a beautiful pendant for that one of a kind necklace or some great beads to finish off a project. This is your chance to get outstanding Venetian Glass at great prices. She also has many sale items that you won't want to miss. Save your money or use that Christmas gift for all those goodies. Come and talk to NIcole as she will give you great ideas and her expertise in mixing and matching. Don't miss out on the fun!